This waterproof, mould proof tape can keep your place great and easy to clean if it is sticked on the seam crossing between gas cooker and table, sink and table. 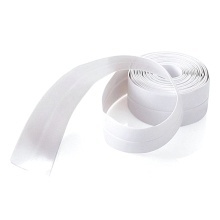 The tape is selfadhesive, you don&apos;t need anything to help adhere it, easy and convenient to use. Threadiness design, and crease in the center of the tape, can fold 90 degree right angle. Can be cut according to your need. Paste firmly, easy to use. then press the tape hardly so the tape will stick firmly and last longer.